Editors Note: I just wanted to thank Manny Vargas for taking the time to sit down and knock this out with me. Manny's a modest guy, but the reality is that this is a bodyboarder who is known worldwide. 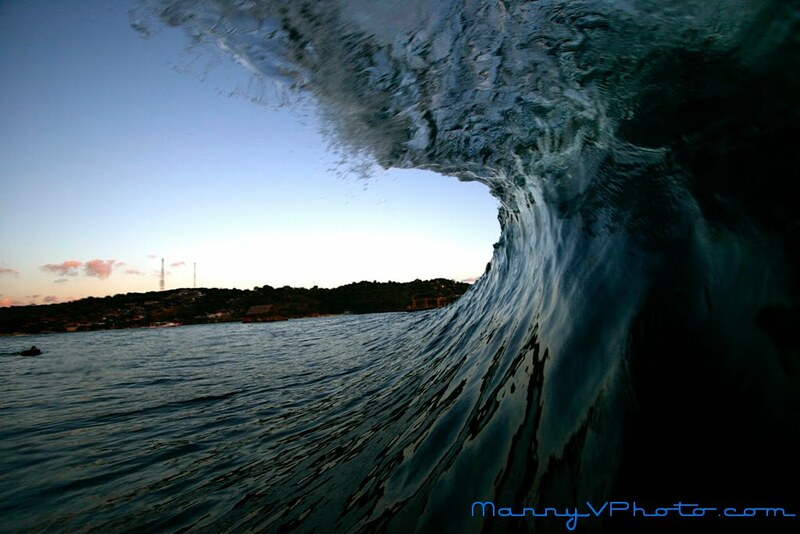 Manny is hugely respected for his surfing and his humble demeanor. Don't get me wrong, the court jester is hiding just below the surface but most of the time this is a soft spoken guy who takes his photography seriously. Bodyboarders seem to be the shoe-ins for difficult water shot assignments- just check out the work of Mike Stewart and Todd Glaser (guy nailed a couple of Surfer Mag cover shots)... the spongers know how to get in the pit and get it done. P.net: Speaking of gear, what are shooting with these days? Manny: I've upgraded to the Canon 7D and a Tokina 10 - 17mm fisheye lens. Going from the 20D to the 7D is like going from a standard hot dog at a little league game to a Tijuana Danger Dog with all the fixings! If you’ve had a TJ Danger Dog, you know what I’m talking about. I also have a 100-400mm lens for land shots and the 28 - 105mm kit lens that came with the 7D. P.net: What's on the wish list? Manny: Well, it's just wishing right now.... But sooner than later I’d like to get a hold of a Canon EOS-1Ds Mark III, Canon 5D Mark II, 14mm 2.8, 24-105mm f4L, EF 70-200mm f2.8 IS, EF 50mm f1.2L, EF 600mm f4L IS, 100mm Macro. Pulling that together is a goal. It’s possible, right? P.net: While we're on the topic of dreams... if you could pull together a dream trip where would you go and who'd be there with you? Manny: Oh man… never really thought of that question. Let’s see. For sure, my wife would be there for support. I would love to explore more of the South Pacific. From what I've seen, the water color is amazing. And I love the island style of living. Onboard? Shoot, Roach, Sean Fowler and a couple other people who understand the difference between respect and having fun. P.net: Anything we should know about working with a water photographer? Manny: Talk to the photographer. And when the photographer speaks don’t just "hear" him or her... really listen. Just like an experienced wedding photographer choreographs his portraits in response to the environment around him, the same goes for water photography. The water photographer is looking at the same wave as you but from a different angle. Oh man, I could go on with little tips and tricks but you’re going to have to book a session with me! Hit me up and I’ll make you a better photographed wave rider. P.net: Definitely... let's get your contact information out there. Where can we reach you? Manny: I'm easy to find. On the web, I'm at www.mannyvphoto.com. If you're fired up, just call me at 619-788-2456 and you can book a session. Other than that I'm shooting practically everyday. You can also check out what I've got going on more or less daily at www.mannyvinthewater.blogspot.com- I'm having a lot of fun with that site so check it out. P.net: Killer- thanks a lot for sitting down and busting this thing out... any last thoughts? Manny: I love taking water photos. That’s number one. But when the waves are perfect… I’ll shoot, but sometimes I need to get on my sponge and get slotted too. Can't really blame me, can you? P.net: Nope! Thanks Manny- see you in the water. Manny: Right on- thanks a lot. 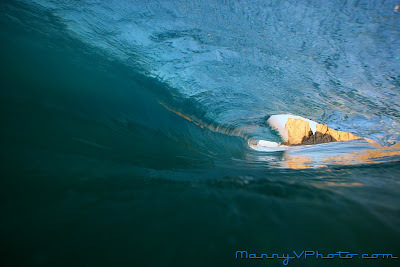 Be sure to check Manny's work out at his site: www.mannyvphoto.com, Manny's fired up to put his life in danger shooting hard charging stand up paddle rippers... if you're looking for the shot, call Manny! hay i saw you today at la jolla i think and u said come check out your page ?